The 2014 Tour de France will commemorate the 1914-1918 war but this time of year sees many in annual remembrance ceremonies, the rituals of wreath laying and the pledge of “never again”. Last year I looked in brief at the fate of four celebrity riders Lucien Petit-Breton, Octave Lapize, Ludwig Opel and Roland Garros. But what of all the others? Here are a few stories of riders who might not be famous but their names are not forgotten. What stands out is the futility of their deaths, a training ride gone wrong or a river crossing that was too cold. 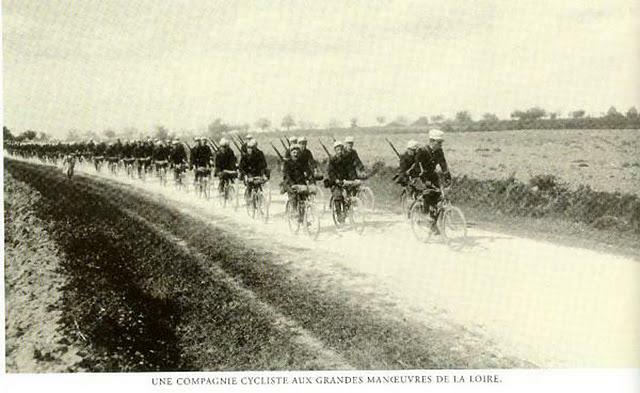 In his book “De la fleur au guidon à la baïonnette au canon“, which translates as “From the flower on the handlebars to the bayonette on a gun barrel” historian Jean-Paul Bourgier writes about the 1914 Tour de France. The race started on the same day as Franz Ferdinand, Archduke of Austria was assassinated in Sarajevo, the often-cited single causal factor for the outbreak of war although tensions between France and Germany had been rising for years. The Tour finished on 26 July and two days later Austria declared war on Serbia. Serbia sought help from Russia, Austria asked the Germans for help and in turn the Russians allied with France, hence World War I. By 1 August the French government ordered mobilisation, the act of assembling troops. Many riders from the Tour signed up and so did readers of L’Auto, the newspaper behind the race and France’s leading sports paper. Many were impressed by the vitriolic nationalism stirred up by a certain Henri Desgrange. The man behind the Tour de France is celebrated today for sporting passion and entrepreneurial genius but there was a darker side. Desgrange didn’t just love his country, he hated Germans and Prussians. His more sinister side is worth revisiting but note he frequently gave space in L’Auto to Maurice Barrès, a proud nationalist politician to some, a bigot and anti-semite to others. 14 of the 1914 Tour’s riders would die and a total of 48 Tour finishers across the years would meet the same fate according to Bourgier. We might think of the Kemmelberg as an important point on the route of Gent-Wevelgem but hills were obvious strategic points for warfare. It was on the slopes of Mont Kemmel that Camille Fily died, he rode the 1904 Tour and holds the record as the youngest start (and finisher) of the Tour de France at 17 years and one month. Less distinguished cyclists include 1914 stage winner Emile Engel was later thrown off the race but never got a chance to race again, the first to fall in the Battle of the Marne in September. 1906 Lanterne Rouge George Branchard died in 1918. It wasn’t just the French. British sprinter Tom Gascoyne died in October 1917 in the Battle of Passchendaele near Ypres, the start town for one of the Tour’s stages next summer. The story of Belgium’s Marcel Kerff is an odd one. He was known for his endurance and came from a butcher’s family. Apparently he would ride from Belgium to Paris, a 600km round trip, just to collect a large haunch of meat and pedal back with the bovine cargo. Such journeys meant the 1903 Tour de France held few surprises and he finished sixth. But on the outbreak of war he was out for a ride and came across a camp of Prussian soldiers. Curiosity got the better of him and he rode over to have a closer look. But the invading troops accused him of being a spy. He denied it but no avail, his tongue was cut out and then he was buried in a mass grave. A memorial to Kerff can be found outside Moelingen in Belgium, just next to the border with the Netherlands. The war was not confined to the battles in northern France and Belgium. Another cyclist to fall was Ernst Franz. His tale is one of Europe as a whole. Born in Bohemia in the city of Karlsbad, it’s today Karlovy Vary in the Czech Republic but the town that has changed nationality more times than most. Frantz was an accomplished rider, the German national champion in 1913 at the age of just 19 and winning races like the Große Völkerschlachtsfahrt, a 250km time trial. His name is eternal on the palmarès of races that thrive today like the Rund um Köln and the GP Frankfurt. He was conscripted by the Austrian Army and sent to fight in the Carpathian Mountains on what is today the border between Slovakia and Poland, and he died in February 1915. Carlo Oriani won the 1912 Giro di Lombardia and the 1913 Giro d’Italia. He joined the army and saw action on the Italian front with the Bersaglieri, an early form of special force soldiers known for their rapid activity, for example they did not march but jogged. By the time Oriani signed up they used bicycles for modern mobility. It’s said he swam across the Piave river, beating a retreat after the Italians had lost the Battle of Caporetto. But the cold water got to him, he contracted pneumonia and died in hospital in 1917. Finally the wheel has come full circle. The 1914 Tour de France started on the same day as Franz Ferdinand, Archduke of Austria was assassinated in Sarajevo but on the same day in 2014, ASO will be involved in a criterium race in Sarajevo with the idea of spreading a message of peace. Thank you! Interesting tales – more please. I love the history of cycling and cyclists. In John Foot’s book Pedalare Pedalare, there was an interesting chapter on the strategic role that cyclists played in the First World War. It would be interesting to know how many of those riders that started the 1914 Tour and then went to war had their cycling skills employed to help their war efforts. I know it’s not about the First World War, but it would be interesting to know what the state of cycling would be like these days if Fausto Coppi had died of malaria, or Gino Bartali had been killed for his role helping Italian Jews. I suspect it would be a very different sport somehow. Thanks for another great article. The stories of the individuals are always fascinating and in this case extremely moving. Great piece and well timed, thanks. Fantastic piece. I’ve always believed that cyclists would make good soldiers as pain, suffering, and deprivation are both required characteristics of both roles. Then again, choosing to go hungry when you know you have access to a ready food supply, and riding 5 hours through the cold rain, but knowing it will eventually end is a bit different than sustaining on the bare minimum at the front, while living in seemingly never-ending dirty and cold conditions. Nevertheless, the exploits these men achieved in bike racing pale in comparison to the ultimate sacrifice they made for their countries. Very much looking forward to 2016 and the stage (start/finish?) in Verdun. Riding through the battlefields of northern France and Belgium always makes one wonder why – why such a waste of young life. A timely article INRNG. Thank you. Thanks INRNG. Your articles are a refreshing change to the on-going Armstrong babble that populates most other cycling sites. Fantastic piece, never forget the sacrifices these young men made. Sad loss of life on both sides of the conflict. Although this doesnt fall into the forgotten category, I have just finished reading “Road to Valor”, the story about Gino Bartali, including his role in WW II. Highly recommended. I know he is not a ‘fallen rider’ but a rider from that era whose story I will never forget is that of Henri Van Lerberghe, the ‘Death Rider of Lichtervelde’, so-called as he would tell the other riders at the start that he would ride them to death! He had a habit of taking off in a breakaway in the early part of a race, but always overtaken and dropped before the finish. That was until the 1919 Tour of Flanders. He was only a day or two back from the frontline and had to borrow a neighbour’s bike. He did his usual trick of threatening the other riders at the start, they let him go off on his breakaway, only to cross the finish line…14 minutes after him! And he still had time to stop at a cafe on the way for a few beers! Outstanding work again. Octave LaPize ‘Now there was an Ace’! Very timely piece. Another casualty in WW1 was Francois Lafourcade, the rider who led Octave Lapize over the Aubisque in 1910 and was consequently famous for not yelling ‘assassins’ at the organizers, like Lapize did. A very interesting article, thank you. I rode past Moelingen yesterday. It’s an unremarkable little village just south of Maastricht. If you look at it on Google Street View there are at least 2 guys on bikes within a couple of hundred metres of each other – fietsparadijs as they say around here! The history of WW1 the areas of Northern France and Belgium have many stories that the bike played a part in. Many Australians that served in the Light Horse brigades we’re sent to Northern Europe but we’re not allowed to take their horses. They were issued with bicycles and somehow meant to navigate the mud and storm trenches. My great grandfather was one of them and was lucky to make it home. Can’t say he continued a love for the bike when back in Australia.